Congratulations to our Jobmatch participant Cyril on his new job with MMS NI Ltd, Toomebridge. MMS NI Ltd specialise in sourcing products such as tyres, wheels, welding wire and trailer manufacturing parts for a variety of customers. Cyril joined the Jobmatch programme and worked proactively with his Employment Coach, Shauna. He had experience working with The Roads Service but felt that gaining a forklift licence would open up more opportunities for employment. Shauna was able to offer Cyril counterbalance forklift training which is free through the Jobmatch programme. Cyril successful completed the training and obtained his forklift licence. He also received help with the practicalities of applying for jobs – developing his CV, drafting cover letters, completing application forms and practising his interview skills. Once equipped with the skills and training necessary to get back into work Cyril and Shauna began to search and apply for Forklift vacancies. 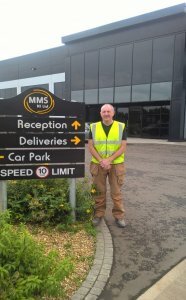 Cyril was delighted to be successful in obtaining a job with MMS NI Ltd as a Forklift Driver/Store person. He has commenced his role and all is going well. We wish Cyril every success in his new role.